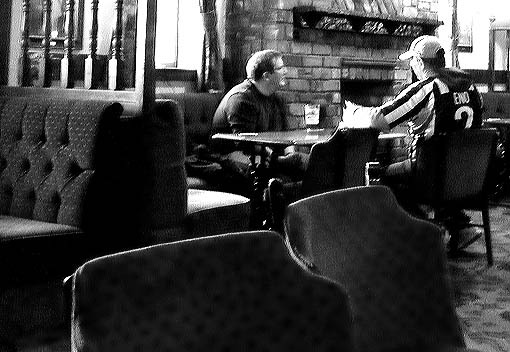 I like the Peak District, and I like pubs, but very often I don’t like the pubs in the Peak District. This was the gist of some closing remarks in our last Week in Pubs post, and some of you have added comments on this issue. Ian Loasby has also Tweeted in agreement with the general point, and also with the singling out of the Cheshire Cheese at Hope as a notable exception. “The Grouse, Red Lion at Litton, also the Bull at Foolow, Packhorse at Little Longstone” are the establishments Ian also says are worth a look. Hmmm – the Packhorse might be that fantastic village pub I discovered while walking the Monsal Trail a few years back (there’s another reason I should’ve started this blog much sooner). Anyway, thanks to Ian and those others of you who commented. Keep ’em coming if there’s anything else to add! In other pub news, it looks like the Harp in Covent Garden, London has won Camra’s national pub of the year award for 2011. This will disappoint anyone who was rooting for Sheffield’s Kelham Island Tavern to make it a hat-trick. But congratulations to the team at the Harp – I thought it was great when I visited last year. This week in pubs begins early: Monday afternoon, to be exact about it. I’m in the Rutland Arms here in Sheffield (featured here, pictured above), wondering exactly how in the world a black lager came to exist, why I’m drinking it, and whether I can afford another one because it’s really quite nice. After telling Marianthi I’ve already eaten, I seem to end up scoffing most of her bhaji butty. This satisfyingly carby assemblage of onion bhaji, chips, curry sauce and naan bread raises two more important questions: how the Rutland can afford to sell it for £3.50 and why I’ve never had it before. On Tuesday I find myself described by a fellow drinker as “a new customer” on something like my tenth visit to the Blake Hotel since it reopened in November. It’s the first time I’ve been here in mid-afternoon, though. Instead of the usual struggle to find an empty seat, there’s a struggle to see one that’s taken. Four or five blokes swagger around the bar and apologise for swearing in the presence of a woman. Marianthi shapes to pay for our beers. I insist on doing it, because if the blokes deem it necessary to apologise for swearing in the presence of a woman, then I know they’d also feel duty-bound to comment archly on a woman buying a drink for a man. A few hours later I’m reading some poems (and a piece about the Wenlock Arms) for the inaugural Northern Lights, a new spoken word night back at the Rutland Arms. One of the poems is inspired by a walk I took the other year to the coast via Humberston Fitties, a vast complex of chalets and static caravans on the southern periphery of Cleethorpes. It’s a great night. I seem to be quite tipsy by the end of it. Tipsy enough to roll up at the Blake Hotel (pictured above) again just before closing time, and tipsy enough to get chatting to a bloke at the bar. Not so tipsy that I can’t later recall the striking coincidence of him telling me about his chalet on the Humberston Fitties. But certainly tipsy enough for me to give him the copy of the poem that’s folded up in my pocket. On Friday evening I’m at the Lescar over at Hunters Bar. My friends’ club night Pop-o-matic is here for the first time. There is space-themed fancy dress, there is fine music, there is much love and comradeship. Oh, there is also a large, scary man in black clothes closing down the night before its allotted hour and shouting at everyone to finish the drinks they’ve just bought. At a lesser pub this would just about ruin your night completely. The Lescar is an excellent pub, so it just spoils it a bit. But it’s also nudging three quid a pint here now, which simply means I buy fewer pints. That’s no good for me, the pub, the brewers of its excellent beer or indeed the wider economy, is it? Just saying. One Saturday everything will go right. First South Yorkshire will run an acceptable bus service. The players of my football team will justify their salaries and compete on the pitch for 90 minutes. I will get to watch them when they do, instead of having to go shopping for a new car or something. 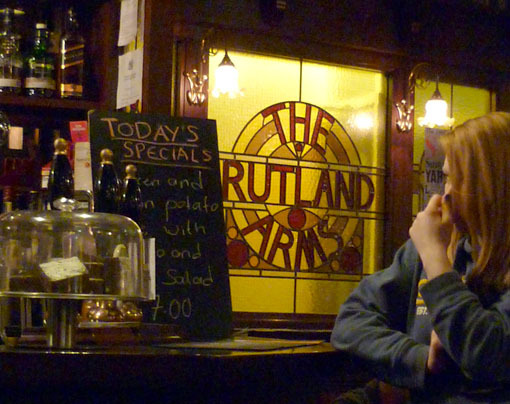 And on this glorious day, just before the match, I will go to the Rutland Arms in Grimsby (featured here, pictured below) and finally have a pint of Old Mill Bitter that tastes of something. Last up this week, it’s a quiet Sunday evening with my friend Cara at the Red Deer. The new folks behind the bar are charming and the beer is in absolutely top nick. 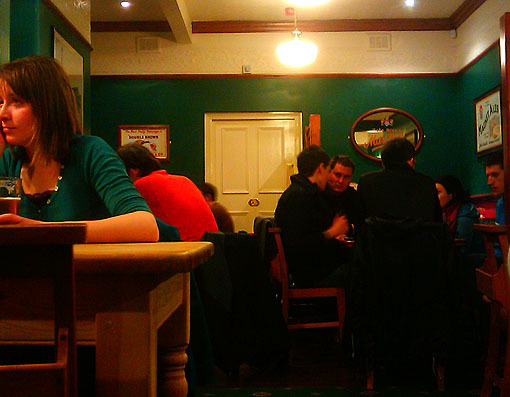 If you’re a Sheffielder and you haven’t been to the Red Deer for a while (or at all), try and drop by. I’ve been going there at least six years now; it’s always been good but now it may be better than ever. First visit for a couple of years last week and we were very impressed with the place. Its as good as its ever been.